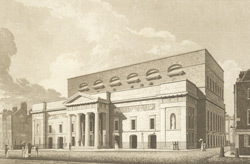 Artist and engraver: Hawkins, G.
View of the Theatre Royal in Drury Lane, London in 1809. The Theatre Royal in Drury Lane was the place of scandal and controversy. In 1716 the future George II survived an attempted shooting here. In 1780 the Gordon Rioters attacked the theatre on account of its use of 'papists and Frenchmen'. In 1800 there was another royal assassination attempt - this time on George III. Although a new theatre was built (designed by Henry Holland) in the late eighteenth century, it burned down on 20th September 1808. This view shows its new replacement by a design of Robert Smirke, who was also responsible for the British Museum. Smirke's Theatre Royal was open by Sept 1809, but within a short space of time the theatre burned down again. (fires were frequently started in theatres when stage lighting caught on drapery or costumes). It was rebuilt in 1811 to an expensive design by Benjamin Wyatt.